Within a short week’s time, this loving and dynamic duo from Massachusetts made plans to hop a plane to Seattle to get married! But where? 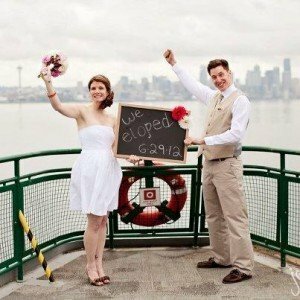 When I brought up the idea to get married on a Washington State Ferry, they were “on board” – they loved the idea and totally went with it. Andrew and Jenny contacted Seattle Photographer, Jenny GG, and happily, Jenny was available. They initiated all marriage license paperwork from out-of-State and got on a plane to the Puget Sound area on a happy Monday. Jenny and I met Andrew and Jenny on board the 10:25 a.m. Bainbridge Island – Seattle run – June 29, 2012. A ferry employee, Whitney, all decked out in what Andrew called her “bright yellow ferry costume” was one of our witnesses (along with Jenny) and within minutes of sailing, we all moved to the front of the boat for our ceremony. With hundreds of on-lookers from inside the ferry, we got Andrew and Jenny married…Washington State Ferry Style. Congratulations to you Andrew and Jenny!